Here is the key to mindfulness. You’ll find this key in some form in every style of mindfulness practice and every form of meditation, all the way back to the Buddha’s time. Buried somewhere in these techniques is a step back from your emotional whirlwind, one step back into a frame of reference where you see your surroundings completely objectively, with no added values such as good or bad, meaningful or meaningless. Everything that comes afterward is dependent on your ability to take this critical step. 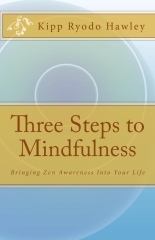 This is so critical that it is the first of the Three Steps to Mindfulness. All three steps involve crossing borders between our mental and emotional mindstates, which we visualize as realms or regions we can move through. We start becoming familiar with these states by giving them names, with the first one being called “Storyland”. Storyland is the “place” we’re in when watching our mind movies, when regretting the past and when hoping for the future. This is the realm of valuations – of hot and cold, good and bad, like and dislike. This is where we sit soaking in bliss, in despair, in daydreams and “daymares”. This is where we spend much of our time, and the place we’re in when not being mindful. There’s nothing wrong with Storyland – it’s a normal part of our mental/emotional existence. But, it’s not the only internal realm we have. The first step on the path to mindfulness is across an internal border to the adjacent realm we name “Orientation”. This is the realm of pure objectivity – no likes or dislikes, no reruns of mind movies, no comparisons. Simply clear awareness of our present conditions with no emotional filters. You know you’ve arrived in Orientation because all your surroundings have snapped into focus. This is the realm of measurements and labels. You’re clearly aware of the time of day, where you are and who you’re with. In Storyland these are all fuzzy, but in Orientation all is clear. When people say “I was gone for a moment but I’m back now” they’re recognizing that they’ve arrived in Orientation after a trip to Storyland. This is a regular part of our experience. But, how many of us consciously use this? This is the key to mindfulness. Learn to recognize when you are in Storyland and when you are in Orientation. Practice stepping back and forth across the border between them until you you can do it at will. Then, go ahead and use it!